It’s hot out. Again. Very hot. And humid. Just the weather I hate. You would think living in Western NY that I would love hotter weather with our record setting winters. But I don’t. I despise it. And it’s not pain. Yes, I swell like the proverbial balloon, but it doesn’t hurt like the cold. It’s the fact that it turns me into completely different person. Because it totally incapacitates me. Inside, I am normal and somewhat pleasant (just being honest here). Outside though, I am the Wicked Witch of the West about two screeches before she disappears in a puddle under her giant hat. I am being totally serious here people. When the weather is cold, it’s easy to understand that those of us with autoimmune issues will experience pain. Most autoimmune issues involve the joints, skin, or circulation all of which react severely when exposed to the cold. A few years back I fell and my arm went into the snowbank up to the middle of my forearm. Not only did I probably wake the dead in the cemetery down the road, but I scared the daylights out of my brother and sister-in-law who became convinced I broke my arm and were completely confused when I kept yelling for a towel. I have Reynaud’s and touching cold objects causes extreme pain for me. But the pain can get just as bad with consistent cold that seeps into the body freezing joints and slowing the circulation that keeps everything warm and as close to normal as possible. That causes a deep ache. That is the constant underlying pain of Winter. But I am talking about Summer. The domain of Heat Miser. ‘Everything he touch(es), starts to melt in his clutch’-remember? These are the days when I live in the basement. Having a raised ranch, the lower level is half below ground giving me a much cooler sanctuary. Or prison, depending. Even at several degrees cooler, when I’m down there I need a fan. I mean THE FAN. 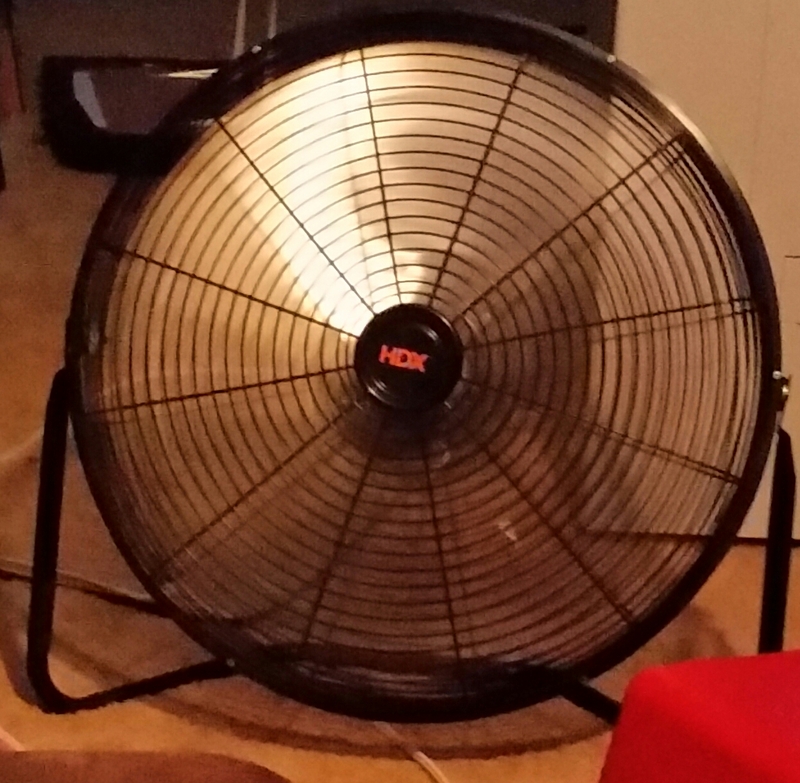 Our industrial sized fan that keeps the air moving and me cool. And close to ‘normal’. You see, heat affects everyone. You feel sticky and tired and UGH. So for me, the definition of normal (in the heat living in the basement) is generally bored, lonely, and a bit snarky. I can try to do some laundry but the effort turns me into a sweaty, moody mess very quickly. Yes, I have Sjogren’s and I sweat. Alot. A big part of my problem. Some of us don’t. But I do and I have to be careful. So I keep Gatorade and water and salt nearby all summer long. And my fan. At least when I am inside. I have no clue why this happens. I don’t know the disease process or the biology. Only that it does. And that it makes it impossible for me now to enjoy outings with my family, to work at the job I love, to relax by a pool with friends, or just to stand outside and chat with neighbors. If it’s sunny, I still feel it. The pull of all the energy from my cells. But I can survive in shade. But add high heat or any humidity and I’m done, do not pass GO, banished to my basement-my little cave. So now maybe those of you who have seen my basement understand why it looks like a beach. From paint to decor to the sea glass fireplace. When you have to live in one room for up to a week at a time during a heatwave, it helps if it looks like paradise!